MSNBC was the second-most-watched cable news network in prime time for February 2017, and the No. 4 network in total prime time viewers across all of basic cable. The network also grew +55 percent in total prime time viewers and +41 percent in the prime time news demo compared to February 2016. MSNBC also posted significant year-over-year growth in total day: +53 percent in total viewers and +40 percent in the demo. That’s more year-over-year growth than either CNN or Fox News. It was an especially strong month for Morning Joe. The program posted more total viewers than rival New Day for the 24th straight month, and its average of 849,000 total viewers is the 2nd-highest total for the show and for the network in the time period. The Rachel Maddow Show continues to thrive in the 9 p.m. hour, posting significant year-over-year growth and ranking No. 2 in total viewers and the key news demo in February 2017. 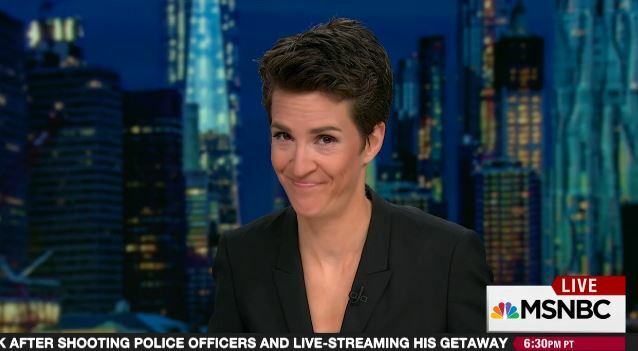 In fact, Maddow delivered MSNBC’s biggest total viewer audience in the 9 p.m. hour this past month, the best delivery in the news demo since November 2012. NEW YORK (February 28, 2017) – For the month of February 2017, more people tuned in to MSNBC than CNN. MSNBC weekday prime (M-F 8-11pm) finished #2 in total viewers among all cable networks, beating CNN for the third straight month. MSNBC prime delivered higher growth than the competition, posting a gain of +64% among total viewers compared to February 2016 (vs. -29% for CNN and +30% for FOX News). MSNBC also ranked #3 in total day (M-F 6am-2am) audience among all cable networks in total viewers. MSNBC’s full day growth far outpaced the competition, delivering the third most growth in all of cable and posting a gain of +60% compared to February 2016 (vs. +16% for CNN and +34% for FOX News). Year-to-date through February 2017, MSNBC is the fastest-growing cable network among all cable in weekday prime, up +63% in total viewers over 2016 (vs. -6% for CNN and +28% for FOX News). More viewers tuned in to “Morning Joe” (M-F 6-9am) than to CNN’s “New Day” for February 2017 for the 24th consecutive month. “Morning Joe” also ranked #2 among all cable networks in the time period for total viewers. “Morning Joe” delivered 849,000 total viewers, the second highest ever for the show and for the network in the time period. “The Rachel Maddow Show” (M-F 9-10pm) saw significant growth across the board and finished #2 in both total viewers and the key news adults 25-54 demographic. “The Rachel Maddow Show” delivered MSNBC’s and the show’s biggest total viewer audience ever in the time period. “The Rachel Maddow Show” also beat CNN’s regularly scheduled programs for the 45th straight month. The show posted its best demo delivery in the time period since November 2012. Since making a strategic shift to breaking news, MSNBC dayside (M-F 9am-5pm) continues to perform strongly, growing faster than both CNN and FOX News in total viewers. MSNBC is up +62% (vs. +51% for CNN and +41% for FOX News) compared to February 2016. MSNBC dayside posted year-to-year gains of +51% among viewers A25-54. Four more MSNBC programs each beat CNN among total viewers: “Hardball with Chris Matthews” at 7pm, “All In with Chris Hayes” at 8pm, “The Last Word with Lawrence O’Donnell” at 10pm, and “The 11th Hour with Brian Williams” at 11pm. NOTE: February 2017 ratings are based on Nielsen Live+Same data day for 1/30-2/26/17. Individual show data represents regular programming only, excluding election night, specials and breaking news. • “Morning Joe” ranked #2 among all cable networks in the time period for total viewers, continuing its winning streak over CNN’s third-place “New Day” for the 24th month in a row. • “Morning Joe” was up +38% in total viewers (847,000 vs. CNN’s 649,000) and +25% in A25-54 (193,000) over last year. • “Morning Joe” posted its second best total viewer delivery ever for the show and for MSNBC in the time period. • MSNBC dayside’s year-to-year growth in total viewers continues to soar over the competition, posting gains of +62% (vs. CNN’s +51% and FOX News’ +41%). • In the key A25-54 demo, MSNBC dayside posted gains of +51% over February 2016. • “Andrea Mitchell Reports” (M-F 12-1pm) delivered more growth than the competition in total viewers. The program was up +71% in total viewers (vs. CNN’s +50% and FOX News’ +48%) and +59% in the demo (vs. FOX News’ +55%). • “Andrea Mitchell Reports” averaged 772,000 total viewers and 156,000 viewers A25-54. • “MTP Daily with Chuck Todd” was up +73% in total viewers and +76% in the demo over February 2016. • “MTP Daily” averaged 1,048,000 total viewers and 202,000 viewers A25-54. • “For the Record with Greta,” which debuted on MSNBC in January 9, 2017, outpaced the growth of CNN and FOX News in total viewers (+60% vs. CNN’s +57% and FOX News’ +27%). In the A25-54 demo, “For the Record” posted more growth than FOX News (+80% vs. FOX News’ +36%) compared to February 2016. • “For the Record” averaged 902,000 total viewers and 198,000 viewers A25-54. • “Hardball with Chris Matthews” topped third-ranked CNN among total viewers for the seventh straight month. • “Hardball” was up +56% in total viewers and +69% in the demo over February 2016. • “Hardball” averaged 1.45 million total viewers and 302,000 viewers A25-54. • MSNBC weekday prime finished #2 in total viewers among all cable networks, beating CNN for the third straight month in February 2017. • MSNBC prime delivered higher growth than the competition, posting gains of +64% among total viewers compared to February 2016 (vs. -29% for CNN and +30% for FOX News). This is the second highest growth among all cable networks (behind Oxygen’s +65%). • In the A25-54 demo, MSNBC was up +48% compared to February 2016 (vs. CNN’s -17% and FOX News’ +38%). • “All In with Chris Hayes” ranked #2 in total viewers for the third straight month and posted the best program delivery in the hour since November 2008. • “All In” delivered more growth than its competition in total viewers (+91% vs. CNN’s +34% and FOX News’ +29%) and the A25-54 demo (+88% vs. CNN’s +68% and FNC’s +45%). • “All In” averaged 1.6 million total viewers and 359,000 viewers A25-54. • “The Rachel Maddow Show” extended its winning streak and ranked #2 in total viewers and the A25-54 demo, beating CNN’s regular programming for the 45th straight month. This is the program’s best demo delivery in the time period since November 2012. • “The Rachel Maddow Show” delivered more growth than FOX News in both total viewers (+99% vs CNN’s +70% and FOX News’ +31%) and the A25-54 demo (+93% vs. FOX News’ +55%) over February 2016. This is the program’s best total viewer delivery in the hour ever, and the best demo delivery since November 2012. • “The Rachel Maddow Show” averaged 2.3 million total viewers and 528,000 viewers A25-54. • “The Last Word with Lawrence O’Donnell” again ranked #2 in total viewers, beating CNN’s regular programming for the 21st straight month. • “The Last Word” delivered more growth than FOX News in both total viewers (+107% vs CNN’s +82% and FOX News’ +49%) and the A25-54 demo (+95% vs. FOX News’ +55%) over February 2016. This is the program’s best total viewer delivery in the hour ever, and the best demo delivery since November 2012. • “The Last Word” averaged 1.9 million total viewers and 423,000 viewers A25-54. • “The 11th Hour with Brian Williams” ranked #2 in the half hour ahead of CNN among total viewers for the 7th straight month. • The program’s growth surged over the competition, nearly delivering a six-fold increase of FOX News and CNN in total viewers (+169% vs. CNN’s +22% and FOX News’ +24%). In the demo, “The 11th Hour” nearly tripled the competition in growth (+121% vs. CNN’s +34% and FOX News’ +26%). • “The 11th Hour” averaged 1.6 million total viewers and 360,000 viewers A25-54. • Saturday editions of “AM Joy” more than tripled the growth of its competition in total viewers (+121% vs. CNN’s +32% and FNC’s +22%). “AM Joy” also posted more growth than CNN and FOX News in the A25-54 demo (+85% vs. CNN’s +74% and FOX News’ +36%). The Saturday edition averaged 981,000 total viewers and 210,000 viewers A25-54. • Sunday editions posted more growth than CNN and FOX News in both total viewers (+87% vs. CNN’s +48% and FOX News’ +29%) and the A25-54 demo (+94% vs. CNN’s +69% and FOX News’ +28%). The Sunday edition averaged 810,000 total viewers and 215,000 viewers A25-54.